Linz and colleagues from the University of Adelaide investigated the night-to-night variability of SDB. They utilized the SDB-detection algorithms of pacemakers and computed the respiratory disturbance index (RDI) for each night. 72 patients with implanted pacemakers participated in the study and RDI values were obtained for a mean of 21±8 weeks. The long-term monitoring revealed a substantial variation in the presence and severity of SDB, which cannot be detected by a single overnight sleep studies. Specifically, RDI variability was found to be lower in patients with the highest burden of severe SDB (as defined by ≥75% of nights with RDI >20 events/hour) than in patients with lower burden of severe SDB. The implications of this finding is that long-term monitoring can be crucial for correct classification of SDB status. Moreover, the researchers recommend that SDB-burden, rather than a categorical diagnosis per se, might be a better metrics to determine SDB-severity in the management if cardiac rhythm disturbances. Nalliah and colleagues from the Royal Melbourne Hospital, evaluated 268 consecutive atrial-fibrillation (AF) ablation patients with the aims of 1)characterizing the prevalence and severity of SDB in these patients and 2)describing the association of SDB severity with the AF phenotype. SDB severity was determined in a formal overnight polysomnography using the apnea-hypopnea index (AHI). SDB was diagnosed in 76.9% of the patients (25% mild, 27% moderate, 25% severe) with median AHI of 13.7. 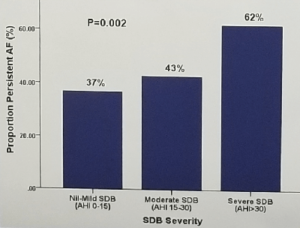 Increased SDB severity was found to be independently associated with prevalent persistent AF (figure 1). This data highlights that SDB testing is critical among patients considered for AF ablation, to treat under-recognized SDB and improve ablation outcomes. The same group presented another study in which the AF substrate in SDB was evaluated using contemporary high-density mapping techniques. 50 consecutive AF ablation patients (paroxysmal 30, persistent 20) underwent formal overnight polysomnography. 20 patients had SDB and 30 did not (AHI: 41±17 vs 10±6, p<0.001). High density left atrial maps were obtained during paced cycle lengths 600ms from the proximal coronary sinus, using a 20 pole multipolar catheter. SDB was found to be associated with marked atrial remodeling, reflected in lower left atrial (LA) voltages, more low voltage points (<0.5mV) and more fractionation (figure 3). The LA voltage was shown to be linearly correlated with AHI. These effects were more apparent for paroxysmal AF patients. 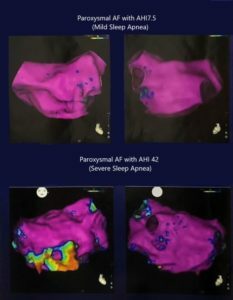 Pimienta and colleagues from the Valley Hospital in New York presented findings regarding the correlation between standard SDB screening tests’ scores and actual obstructive sleep apnea (OSA) presence in AF patients. The Epworth sleepiness scale (ESS) and STOP-BANG (SB) score are most often used to identify patients who would benefit from a home sleep test (HST). In the US, most insurance carriers will not approve a HST without a “positive” ESS or SB. However, the effectiveness of this approach in AF patients remains undefined. The researchers prospectively evaluated 165 consecutive AF patients who underwent a HST and looked for the relationship between an abnormal ESS (≥ 10) or SB (≥ 5) score and OSA severity. Only 17 (10%) patients had a normal HST; mild, moderate, and severe OSA was identified in 50 (34%), 41 (28%), and 57 (39%) of patients respectively. 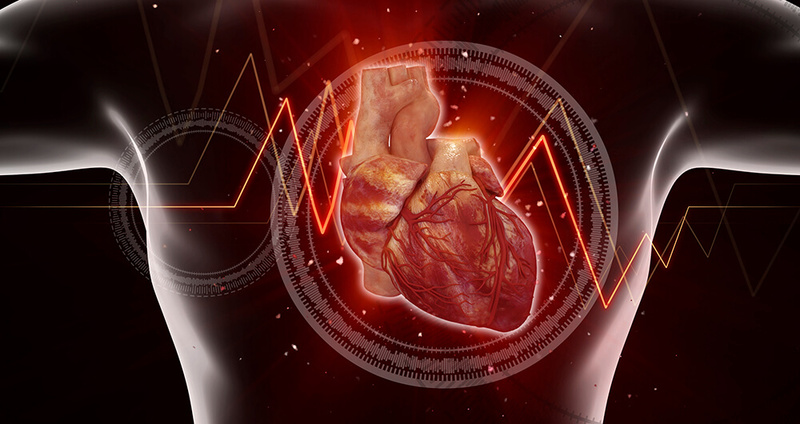 The data showed that most AF patients undergoing HST had OSA, yet most had a normal ESS score. An abnormal SB score alone or either an abnormal ESS or SB score were more likely to identify AF patients with OSA. Moreover, the SB score was shown to preform extremely well in patients with severe OSA. Thus, the researchers believe that the SB score has a central role in the OSA assessment of AF patients.